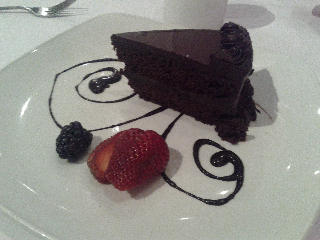 GF Ontario Blog: VILLA Restaurant does not disappoint! I've never been disappointed with my food at VILLA Restaurant. (Examples one, two and three.) I visited again last night and of course had to document my meal. Surprisingly, this cake contained no gluten, eggs or dairy. While I found it to be a little on the dry side, it was packed with chocolate and was a great way to end a meal... whether on your own or shared. 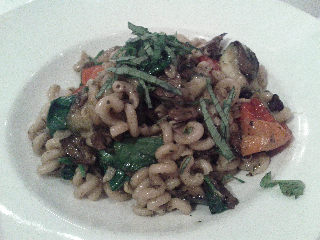 I strayed from my usual Alfredo pasta and went for this Pasta Primavera. Yum! Spinach, mushrooms, zucchini, olive oil - cooked to perfection! I didn't eat the Pizza Pollo... I'm a veggie. But I was told it was really good! 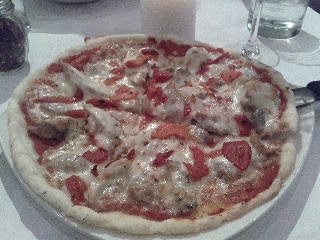 Visit VILLA Restaurant if you're looking for great Italian food in Toronto!